Hi everyone! I’m sharing with you today a super easy chicken appetizer recipe that’s a favorite in our family. 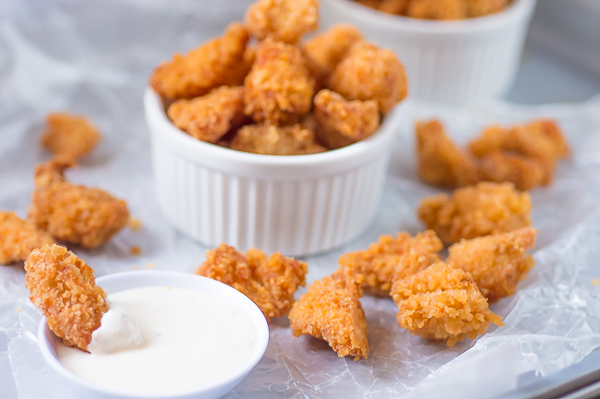 This is my version of popcorn chicken tweaked according to our taste. I was inspired by a recipe I saw in Pinterest a while back, and came up with a different variation which, to my satisfaction, appealed to my family’s taste buds. 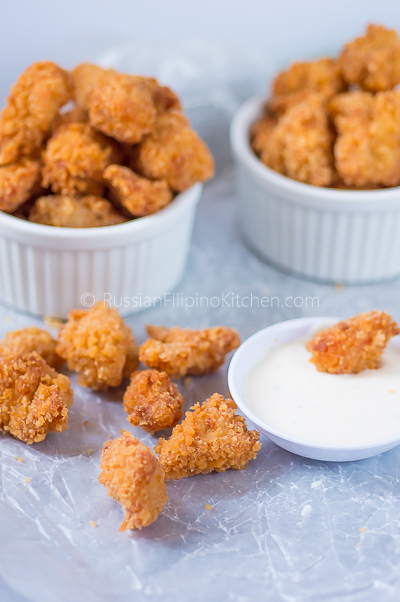 The original recipe is for baked popcorn chicken and uses different ingredients. Although I tried it myself and it was good, I wanted to simplify the process using my favorite ingredients and chose to fry them up instead of baking. In this recipe, I used soy sauce, garlic, and ground black pepper for marinade. I know buttermilk is a good choice as tenderizer but I also know from experience that soy sauce does a great job in tenderizing meats, at the same time giving that “umami” flavor that is distinct in most Asian dishes. I also applied my favorite method in breading, which is coating in flour first before dipping in egg and finally rolling in bread crumbs. 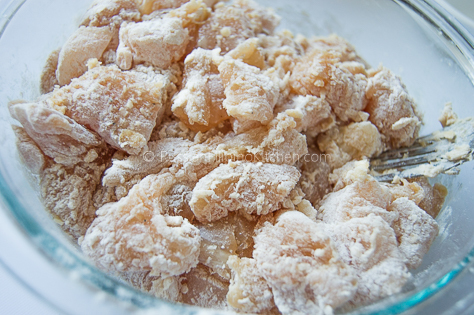 This technique ensures crispy results and not as greasy popcorn chicken bites. 1. Peel and mince garlic. I just use my kitchen knife (paring knife, actually in this tutorial) and chop your garlic as fine as you can. Some people are picky when it comes to chewing garlic bits, but if you’re not one of them, just mince the garlic as tiny as you can. No big deal. 2. 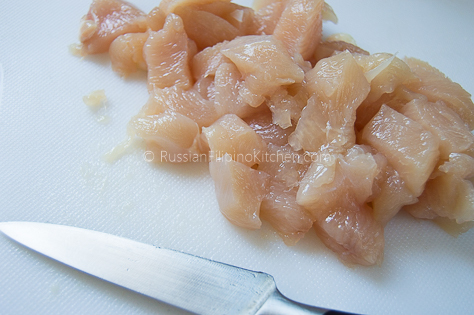 Slice chicken breasts into small cubes (about 3/4 inch thick). You can interchange procedure 1 and 2 by cutting the meat first then the garlic, but I find it easier to do the other way around so I don’t have to wash the cutting board after it touches the meat before I can chop up some garlic. 3. Place chicken, garlic, ground black pepper, and soy sauce into a medium bowl or food container and mix thoroughly to combine. Cover with a lid or plastic cling wrap and refrigerate for 30 minutes. 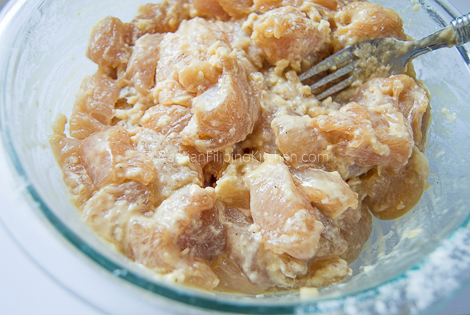 The marinade gives the chicken pieces good flavor while also tenderizing them in the process. 4. 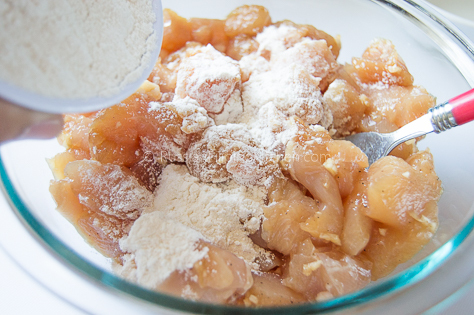 Remove meat from the fridge and add the flour. Use a fork to coat evenly. 5. In a small bowl, crack the egg and beat lightly with a fork. Season with salt. 6. 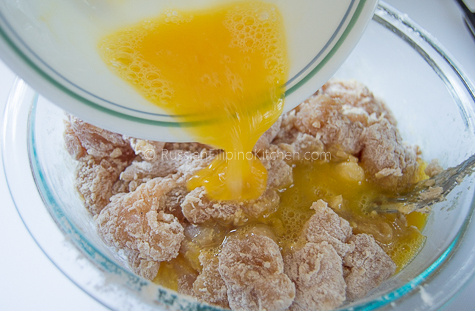 Pour beaten egg into the bowl and mix to coat chicken pieces. 7. Place bread crumbs into a plate. Also, prepare a wide tray or baking sheet. This is where you are going to put the breaded chicken before frying. 8. Now comes the breading part. Use a kitchen tong to pick up chicken pieces coated with egg. Drop onto plate with bread crumbs. Use your fingers to roll the pieces into the crumbs to coat on all sides. 9. Arrange in a single layer on a tray or baking sheet. Repeat step 8-9 until done. 10. Heat frying oil over medium high heat until temperature reaches 350ºF, or till oil sizzles when you sprinkle water on the surface. 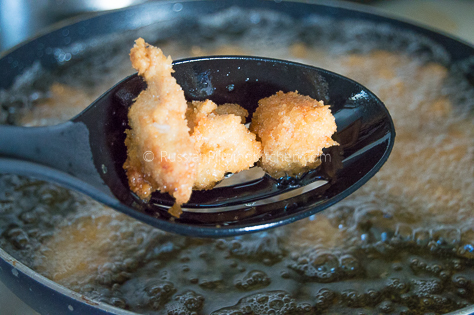 Carefully drop breaded chicken into the hot oil using a kitchen tong. Deep fry for about 10 minutes or until chicken pieces turn golden. I used my 10-inch skillet for frying and it allowed me to fry in 4 batches without overcrowding. Do not overcook or the meat will dry out. It should be crispy on the outside and juicy and moist on the inside. 11. 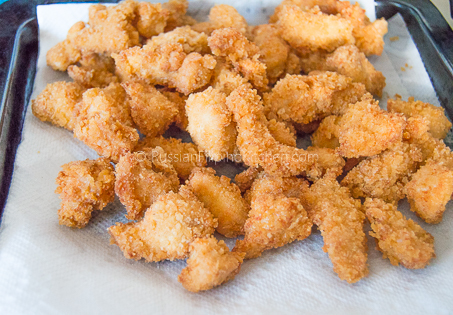 Transfer fried chicken pieces into a tray lined with paper towels to absorb some of the oil. 12. Serve immediately with dipping sauce of choice. Enjoy! Peel and mince garlic. 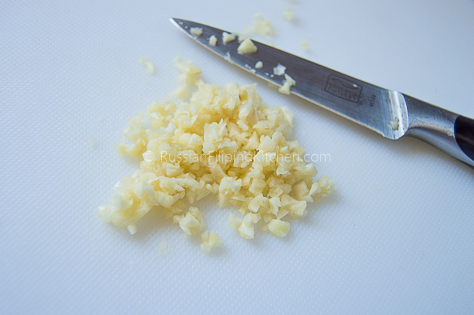 I just use my kitchen knife (paring knife, actually in this tutorial) and chop your garlic as fine as you can. Some people are picky when it comes to chewing garlic bits, but if you're not one of them, just mince the garlic as tiny as you can. No big deal. 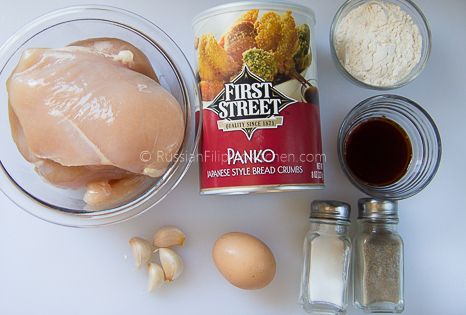 Slice chicken breasts into small cubes (about ¾ inch thick). You can interchange procedure 1 and 2 by cutting the meat first then the garlic, but I find it easier to do the other way around so I don't have to wash the cutting board after it touches the meat before I can chop up some garlic. Place chicken, garlic, ground black pepper, and soy sauce into a medium bowl or food container and mix thoroughly to combine. Cover with a lid or plastic cling wrap and refrigerate for 30 minutes. 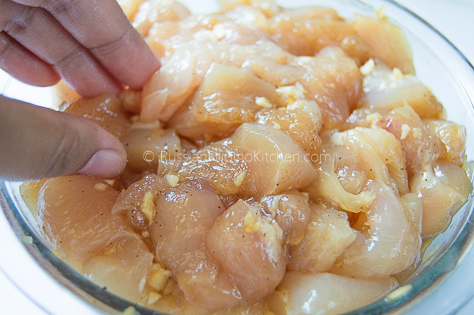 The marinade gives the chicken pieces good flavor while also tenderizing them in the process. Remove meat from the fridge and add the flour. Use a fork to coat evenly. 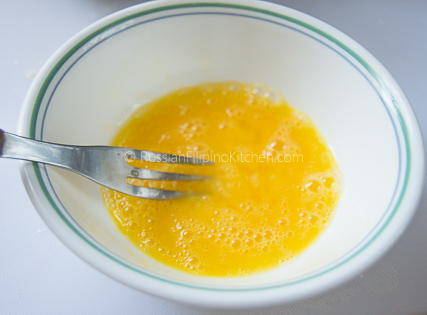 In a small bowl, crack the egg and beat lightly with a fork. Season with salt. Pour beaten egg into the bowl and mix to coat chicken pieces. Place bread crumbs into a plate. Also, prepare a wide tray or baking sheet. This is where you are going to put the breaded chicken before frying. Now comes the breading part. 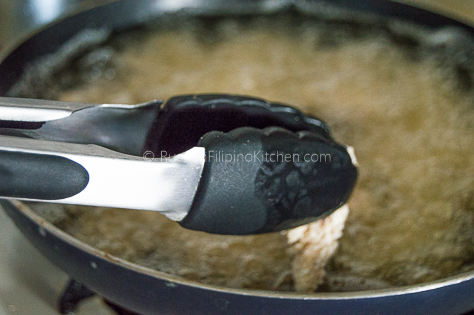 Use a kitchen tong to pick up chicken pieces coated with egg. Drop onto plate with bread crumbs. 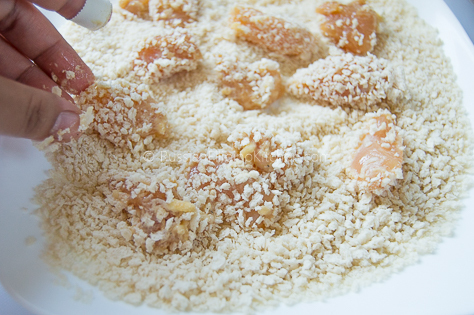 Use your fingers to roll the pieces into the crumbs to coat on all sides. Arrange in a single layer on a tray or baking sheet. Repeat step 8-9 until done. Heat frying oil over medium high heat until temperature reaches 350ºF, or till oil sizzles when you sprinkle water on the surface. Carefully drop breaded chicken into the hot oil using a kitchen tong. Deep fry for about 10 minutes or until chicken pieces turn golden. I used my 10-inch skillet for frying and it allowed me to fry in 4 batches without overcrowding. Do not overcook or the meat will dry out. It should be crispy on the outside and juicy and moist on the inside. 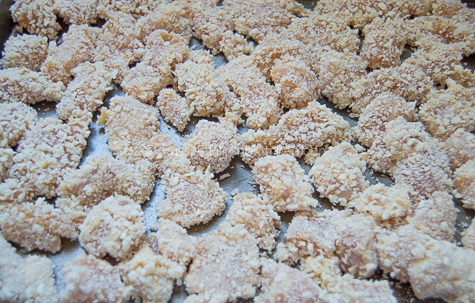 Transfer fried chicken pieces into a tray lined with paper towels to absorb some of the oil. Serve immediately with dipping sauce of choice. Enjoy!